Summertime is known as wedding season in many industries because it’s the perfect time for happy couples to tie the knot. That means that you may be looking for the ideal place to spend your honeymoon this summer, and we have just the spot! Our Gatlinburg and Pigeon Forge cabins are a romantic way to have privacy, luxury, and lots of fun on your special getaway. 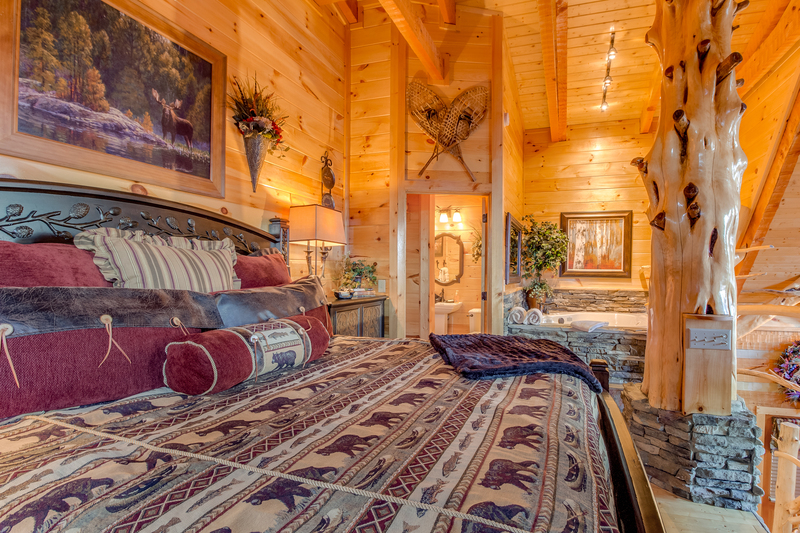 Here are just a few of our romantic cabins in Pigeon Forge and Gatlinburg for you to consider. Do you love the rustic chic appeal of a luxury cabin getaway? Our cabins in Pigeon Forge and Gatlinburg are perfect for a nature-lover’s honeymoon. Surrounded by the stunning views of the Smokies, and just a short drive away from lots of fun in the area, cabins like Wow! and Moonlight Vista are ideal for your summer honeymoon. These one-bedroom cabins feature panoramic views, and luxury amenities like private hot tubs, indoor whirlpool tubs, big screen TVs, video games, porch swings, and more. You’ll be able to quickly drive to downtown Pigeon Forge or Gatlinburg and take in all the local fun, and then get right back to your time together. Fill your honeymoon memories with the sights of the gorgeous mountains right outside your bedroom window. Our classic Honeymoon Hideaway cabin is newly remodeled just in time for your summer honeymoon. This lovely little cabin getaway is designed with beautiful glass walls that let you look out onto the gorgeous view of the mountains – but don’t worry; no one can see into your own cabin resort! Inside, you have everything you need to hide away from the world if you want. Just bring your personal toiletries and food – you’ve got all the linens, cooking tools, and other things you need for the entire stay. Inside, the whirlpool tub is perfect for soaking away the stress of planning your wedding. Outside, the covered deck looks out onto the forest, and includes a picnic table if you want to enjoy the view while you dine together. Satellite TV and Wi-Fi are included, but you can also drive into the city for lots of fun together. Staying in Gatlinburg or Pigeon Forge cabins for your honeymoon is a fantastic way to create a honeymoon that has it all. You can be alone together in a beautiful setting that you’ll never forget. You can go out and have some fun nearby. You can choose to be totally off-grid for your entire honeymoon. Or you can do a little of both! Booking your stay is easy – just find the cabin you love and check the availability on our website. Once you’ve reserved your stay, get ready for an amazing Smoky Mountain honeymoon.